NASN has upgraded its website login. When you see the new login (image below), use the 'reset your password' link to create a new password. You will be asked to supply an email address. This MUST be the email address on file with NASN. If you have questions or comments, please share them in the comment area below or email nasn@nasn.org. An NASN staff person will respond if you have a question or need support. 1. Select "click here to reset your password." 2. Enter your email address --- use the one on file at NASN. Do NOT create a new account if the email address does not work. Contact NASN at nasn@nasn.org. 3. Check your email for a message from NASN. 4. Click on the link in the email to return to the website and reset or create a password. 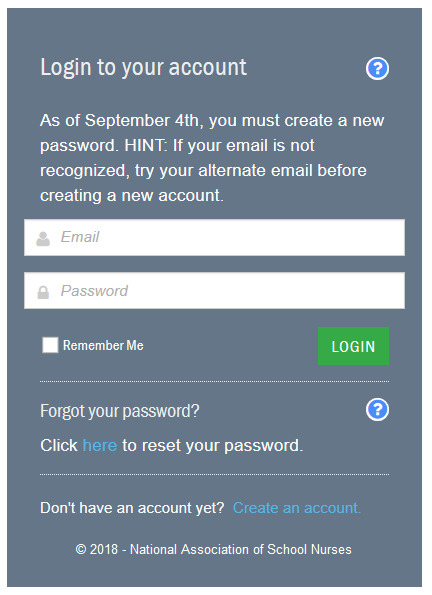 Your email address and the new password will be your new login for the NASN website, SchoolNurseNet, the NASN Learning Center and the new my.nasn.org area of the site.